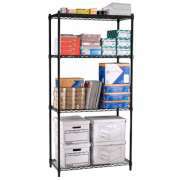 Industrial Metal Wire Shelving - 4 Shelves, 48"x24"
Industrial Metal Wire Shelving - 4 Shelves, 48"x18"
Industrial Metal Wire Shelving - 4 Shelves, 36"x18"
Metal shelving units are sturdy and reliable, and can support just about anything your school, office or church has. With the right configuration, all supplies will stay in a proper place where they can be accessed easily when needed. Hertz Furniture&apos;s collection enables you to fit more inventory than you could have ever imagined in the space you have. Which metal shelves have the most practical design? Our metal shelves are designed to organize your space as efficiently as possible. 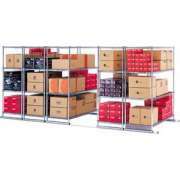 Strong wire shelving can even hold heavy items such as large electronics or high volumes of paper and books. No matter what the size of your school, church or company is, you probably host a few annual events in which the same supplies are used every year. While it is convenient and cost-effective to reuse the same decor and furnishings when adorning the social hall, sanctuary or gym, it can be hard to find an appropriate place to keep these supplies when they are not in use. Cabinets offer functional storage space, but they often don&apos;t have enough room for everything you need to fit in them. You need a place to keep everything from Read Across America Day posters to gym equipment to early literacy development materials organized. What is the most durable shelving? When you need a place to keep boxes of extra office supplies or special room decorations, metal shelving units are a great choice. Unlike wooden shelves or cabinets which have closed sides, wire is open in all directions so it is easy to see shelf contents and retrieve the necessary items in a timely fashion. If you arrange clearly-labeled boxes on the metal storage shelves, the tablecloths or room decorations you need can be located and arranged in a flash. Supply rooms and storage closets can easily become a jumble of items and accessories in which it is virtually impossible to find what you are looking for. With the right industrial shelving, a mess of random things can quickly become a well-arranged area. With this setup, companies can feel free to save money by ordering office supplies in bulk because they will have an organized space for storing excess materials. What are the benefits of sliding industrial shelves? No matter what the size of your storage area is, OFM&apos;s sliding shelf system can help you maximize storage space while keeping everything in an accessible position. When you need to leave an aisle between each set of metal shelves, you lose a lot of potential storage space. With sliding shelves, you can simply move each unit along the track to position the aisle next to whatever is needed at the time. Sliding shelves are perfect for a storage room or janitor&apos;s closet. They have an incredible weight capacity of up to 500 pounds per shelf. 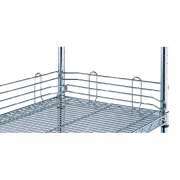 No need to worry about this steel shelving moving while you are trying to retrieve supplies - it safely locks into place. This modular industrial shelving system can be arranged anywhere in no time because the sliding track does not need to be drilled into the floor. If you don&apos;t have enough space or don&apos;t need quite as much storage as sliding shelves provide, we also have individual freestanding metal shelves. Their industrial strength is appropriate for warehouses, factories, office supply and record rooms. S-clips enable you to attach shelves in an “L” configuration to utilize nooks and corners as storage space. For a custom arrangement, extra shelves are available. Optional casters enable you to move your metal storage shelves and their contents without requiring any heavy lifting. How can I prevent items from sliding off of my steel shelves? 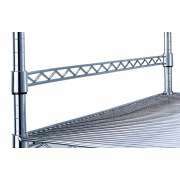 Concerned that items might fall off as industrial shelves are sliding along the track or being moved around? Optional anti-slide plates or bars will keep everything in place. Divider plates further secure positioning on the shelf and keep boxes and supplies in designated areas. For extra stability, shelf liners keep boxes steady and prevent smaller items from slipping through the holes. 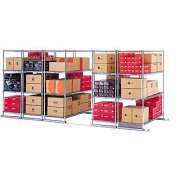 Hertz Furniture&apos;s selection of sturdy commercial shelving units will keep your supplies secure and organized. 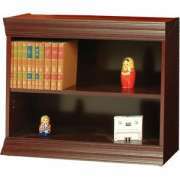 With a great arrangement, you can locate whatever you need more quickly and maintain easy access to all items. If you need help determining the ideal shelf size or configuration, contact the Hertz Project Solutions team for free design and project-planning advice.